3 Days in Corfu. 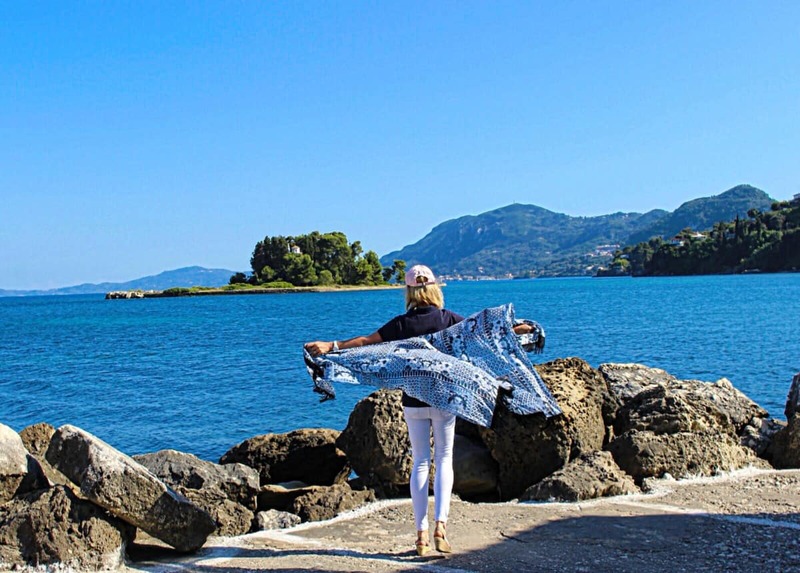 Island hopping in the Greek Islands? Here is an itinerary for a short visit to Corfu. Well, my trip only lasted 3 days but I packed a lot in to the time! 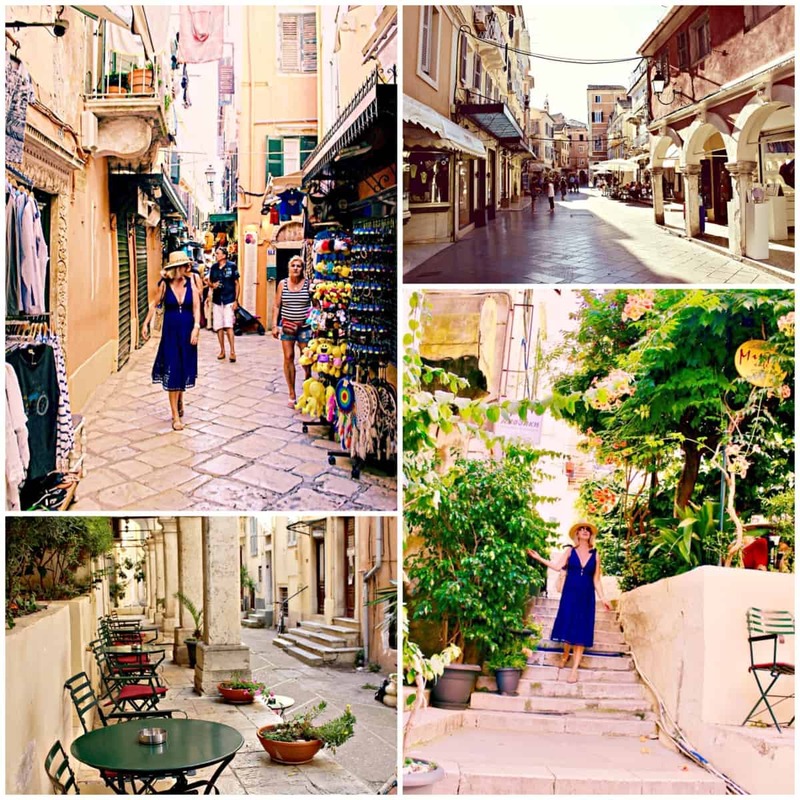 You must definitely visit Corfu Old Town, such a charming place to explore with little restaurants, shops and a fascinating Church. Also, Mouse Island was a delight and is one of the most photographed places in Corfu. Read my luxury travel blog! 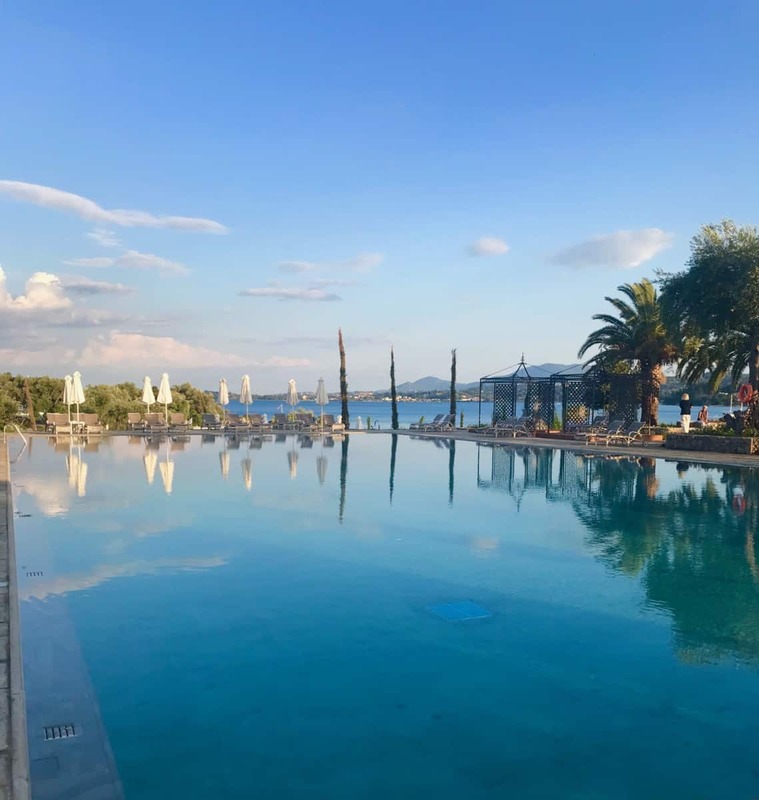 If you are lucky enough to stay at a Grecotel resort they can arrange a private visit to Danilia Village, which was an unmissable treat and definitely a favourite. They can organise all of these trips and many more. Festivals and cultural events of Corfu Plenty of feasts take place in the cosmopolitan island of Corfu throughout the year. Religious feasts & festivals : Easter The celebration of Easter in Corfu is truly a unique experience carrying elements from the Roman Catholic and Orthodox religion. On Holy Friday, the local bands and choir of the island accompany the procession of Epitaphios (the tomb of the Christ decorated with flowers) and the processions of all churches are gathered in Spianada Square, Corfu Town. Preparations start from the early morning hours for the Holy Saturday where local celebrate the first resurrection throwing clay pots from their balconies in Corfu Town. This particular custom is very characteristic of Easter in Corfu. Saint Spiridon Saint Spiridon is the patron saint of Corfu island. The legend says that it has saved the island many times from plague, famine and invasions from Sarakins and Turks in the Medieval times. Although he never lived in Corfu, his relics came to the island after his death. 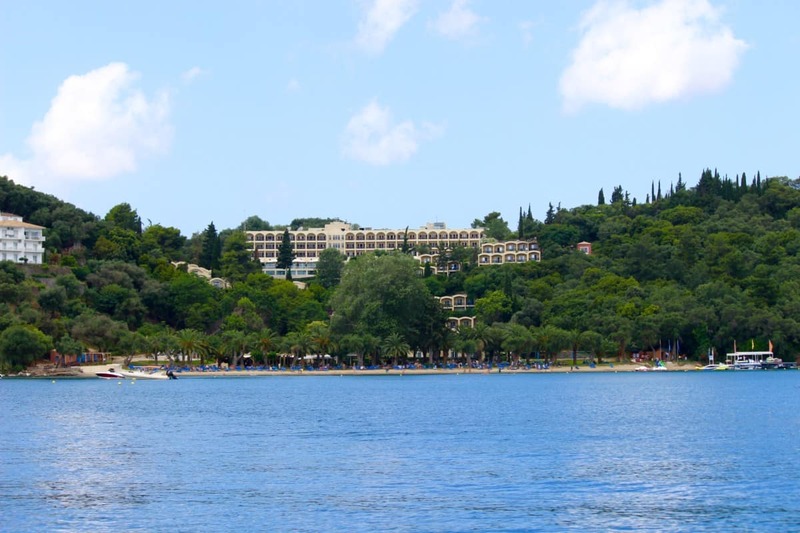 Saint Spyridon is loved by the residents of Corfu and they celebrate four times a year: on December 12th, on Sunday before Easter, on the first Sunday of November and on August 11th. July 2nd On July 2nd, there is a feast in Panagia Vlacherna in Kanoni, Corfu Town. August 6th On August 6th, the feast for the Tranfiguration of the Christ, there is a feast in Pontikonisi. 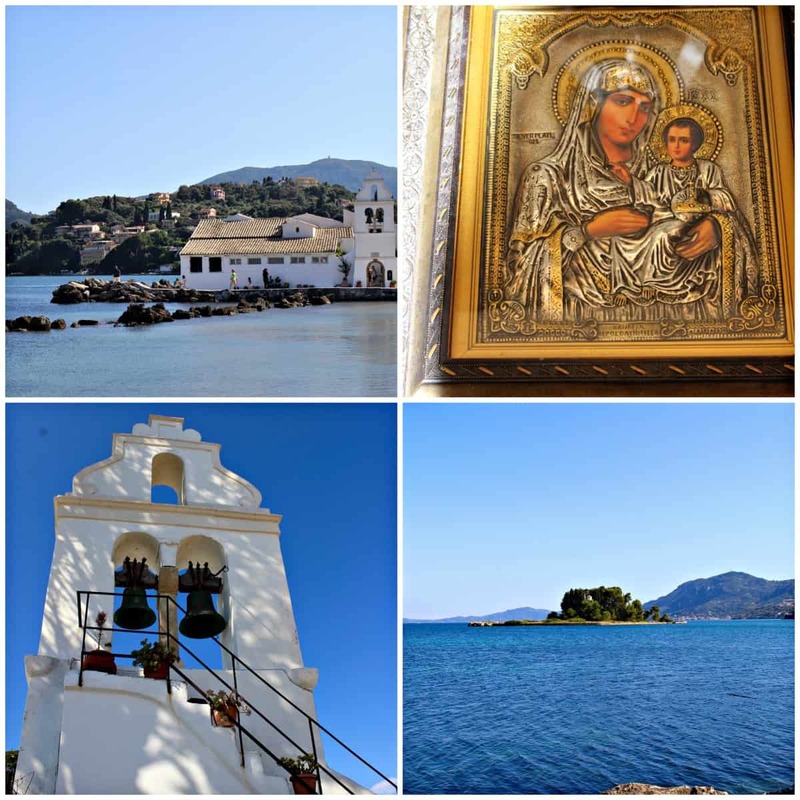 August 1st to 6th, there is pilgrimage in the Monastery of Pantokrator, Corfu island. Carnival The Carnival of Corfu is similar to the Carnival of Venice, as it has its roots in the Venetian occupation of the island in the 17th century. Traditional costumes in Corfu Old Town as well as a great parade in Liston. Varkarola The Varkarola is a special local event which is celebrated every August with choirs in boats singing cantades (traditional romantic songs from the late 19th/early 20th century) while fireworks light up the sky. Cricket Festival. The Cricket Festival is a local custom from the British time in the Ionian islands. This festival is annually and takes places in the huge cricket ground in Espianada Square, Corfu Town. The best way is to arrive by sea, with views of the Fortified Port. 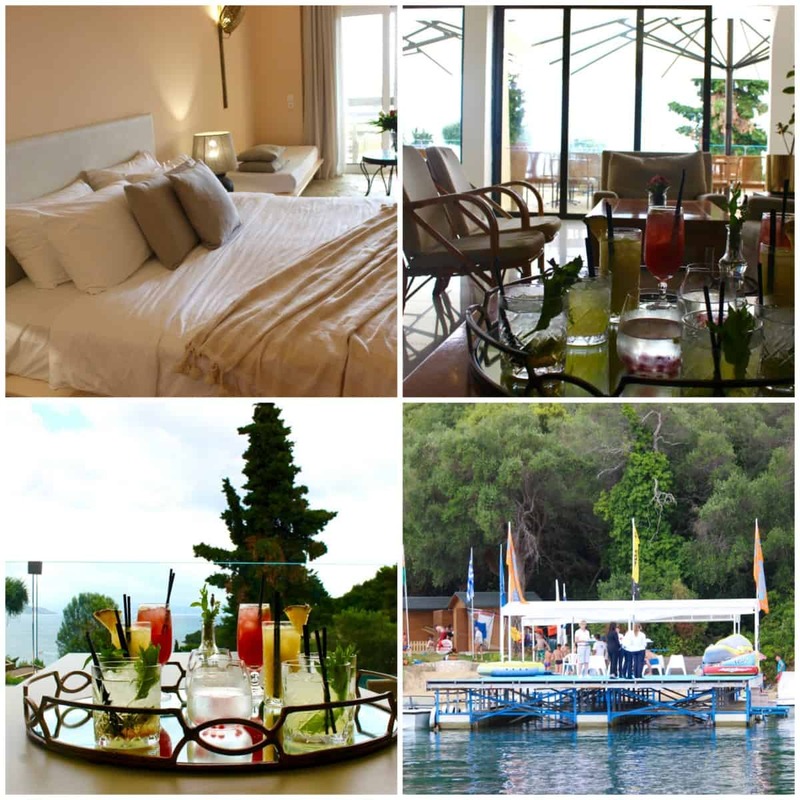 I was lucky enough to take the Grecotel Pontoon from Grecotel Corfu Imperial. 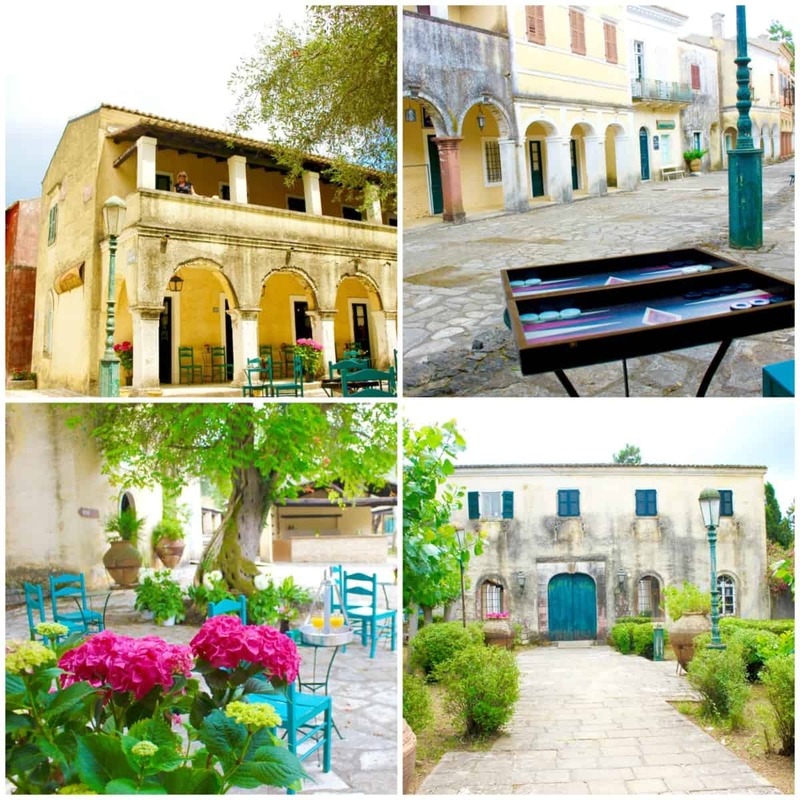 Corfu Old Town is a UNESCO World heritage site since 2007, deservedly so, because it is an enchanting town choc full of history from as far back as the 8th century BC. Something interesting at every turn in Corfu Old Town. Danilia Village is owned by Grecotel, it is the most delightful place to visit, designed in the style of a 1930’s Corfu village. Host to various movies, including James Bond ‘For Your Eyes Only’. Fun to try and spot The Durrells on set locations filmed here. Such a treat! 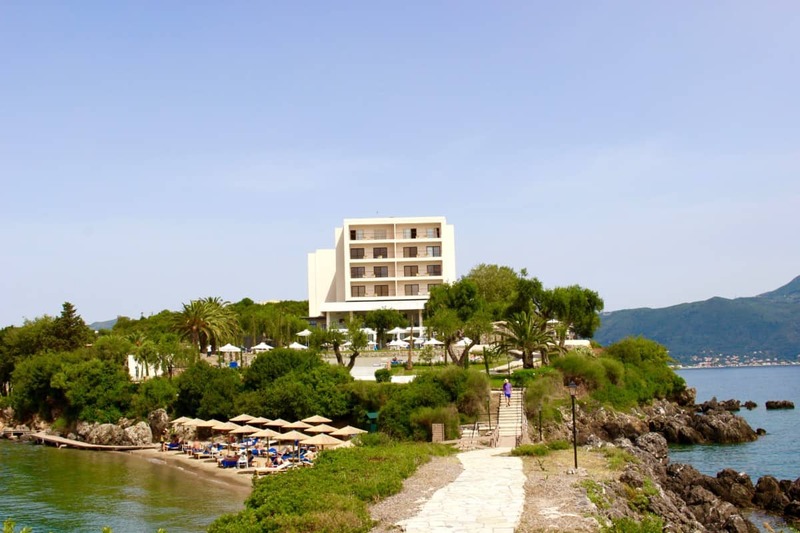 If you stay at a Grecotel in Corfu, they can arrange a complimentary private visit for you to Danilia. Village. It is used for filming some scenes in The Durrells, an english TV program on the BBC right now and very popular in the UK! If you watch the show you will recognise the market scenes and street scenes. Then take a look in the pretty village Church, where you can actually get married! You can also book this for a party or event. I loved the pretty open air Tavern. 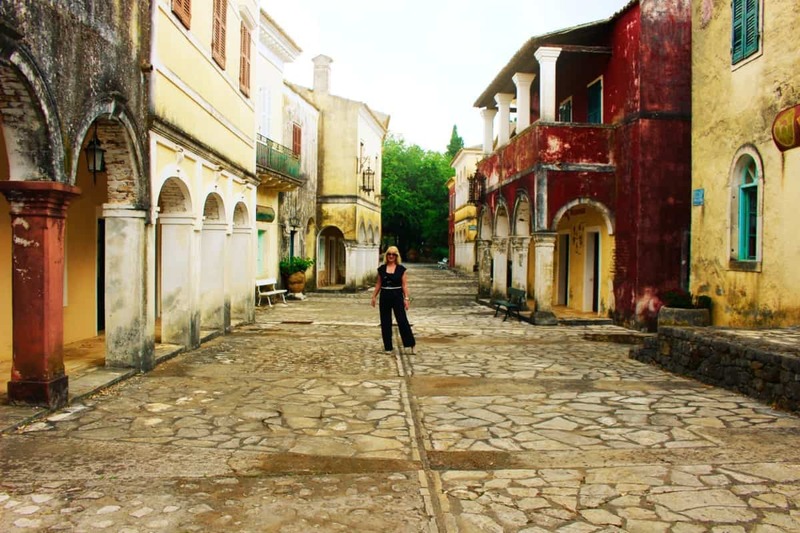 So fun to explore this Corfiot village. Think about a visit to Mouse Island! So idyllic and home to a 13th century Byzantine Church. Also visit the Vlaherna Monastery. Climb up the hill and relax in one of the cafe’s to admire the spectacular views. One of the most popular sites to visit in Corfu so go early or later in the evening avoid the crowds. 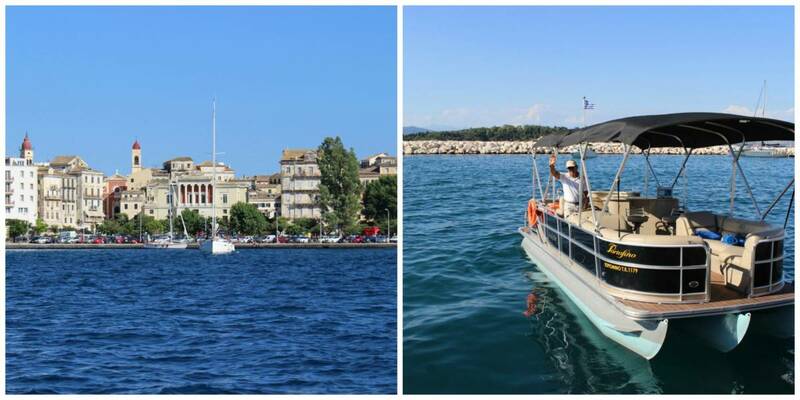 So, these are my 3 favourite things to do in Corfu. I would go back in a heartbeat… such a special hotel with top Class restaurants, exquisite Villas , Suites and Deluxe Rooms. Set on a beautiful, privately owned Peninsula with sister hotels nearby. This is the perfect place to relax and enjoy the beauty of the island in peace and quiet. 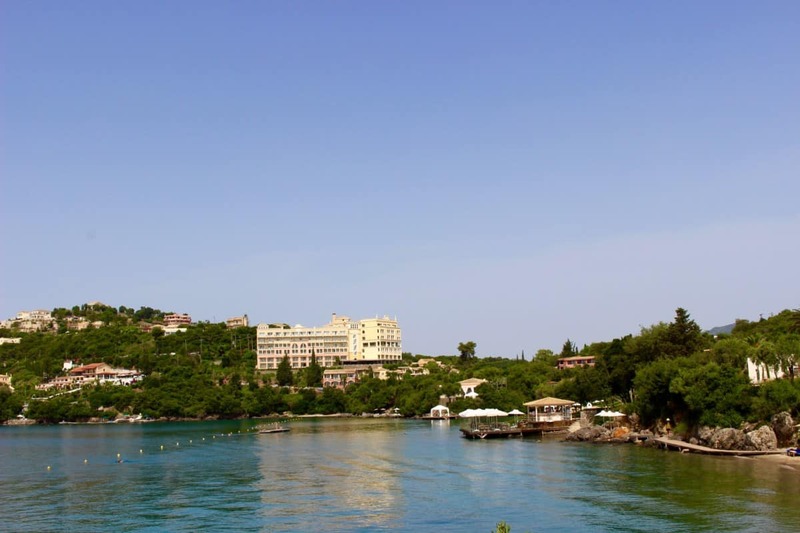 Read my review of the many exceptional restaurants at Grecotel Corfu Imperial. An exceptional hotel, with wonderful friendly staff. You will feel at home and totally relaxed from the moment you arrive until the time you leave! Set on the same Cap is the impressive Eva Palace, with one of the most magnificent swimming pools I have ever seen! Another stylish and chic hotel with fabulous, world Class restaurants. 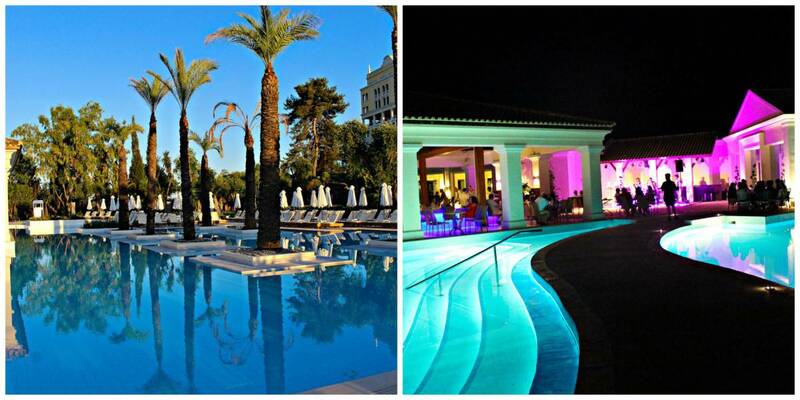 Superb entertainment in the evening at all the Grecotel resorts in Corfu. I love privately owned hotel groups, you always have extra special service and feel like an important guest. A great choice for families, a luxury all inclusive hotel with wonderful restaurant choices, set in a beautiful bay. Read my restaurant review. I enjoyed my trip to the hotel for lunch, water sports and wine tasting! Isn’t that a great combination? Recently renovated, it looks fantastic with super chic Guest rooms. 7 tennis courts and so many watersports. The perfect family choice, the little ones will have the best time and enjoy all of the activities. Tip: Take a look at Aegean Airlines website, great flight prices particularly if you can fly out of high season!